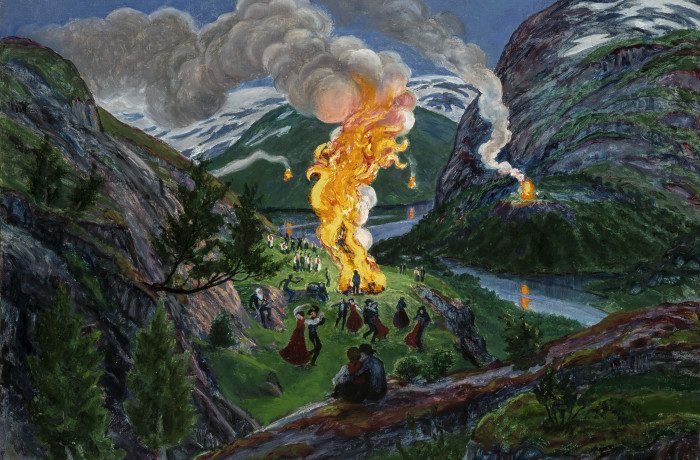 Nikolai Astrup (1880 –1928) may well be the most important Norwegian artist you’ve never heard of. Like his contemporary Edvard Munch, he was profilic in the early 20th century. Like Munch, he pioneered the technique of woodcut printing. Like Munch, he took the natural landscape of his homeland as his subject and, like Munch, he attained national-treasure status as a result. But unlike Munch, no one outside Norway seems to know who he is. This, however, might not be the case for much longer. Dulwich Picture Gallery is presenting the first major exhibition of Astrup’s work ever held outside his motherland. Painting Norway brings together 90 of his woodcut prints and oil paintings, spanning the length of Astrup’s 30-year career, and revealing his uniquely vivid vision of Norway’s western coast. 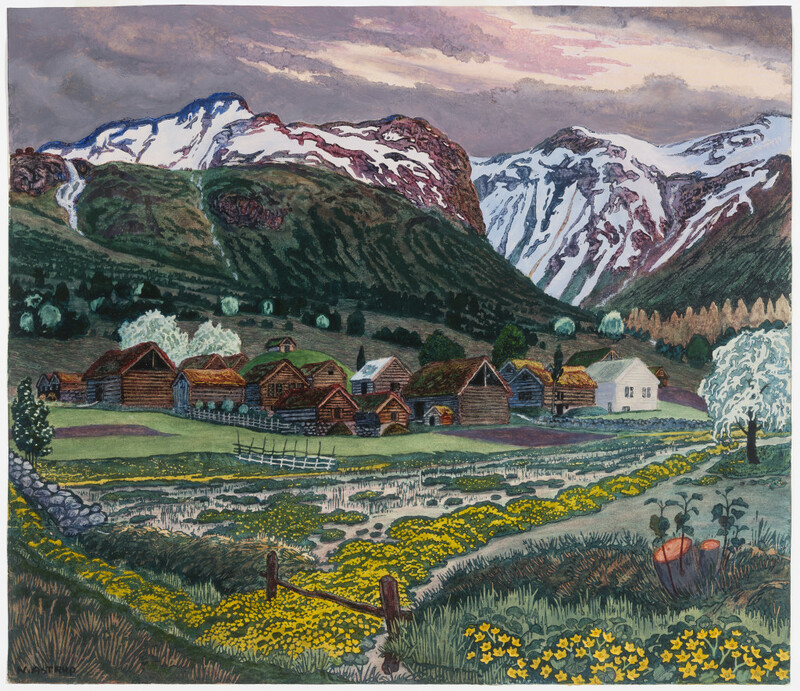 Born in Bremanger, Nordfjord, Nikolai Astrup spent his childhood in the small village of Ålhus in Jølster, Sogn and Fjordane. 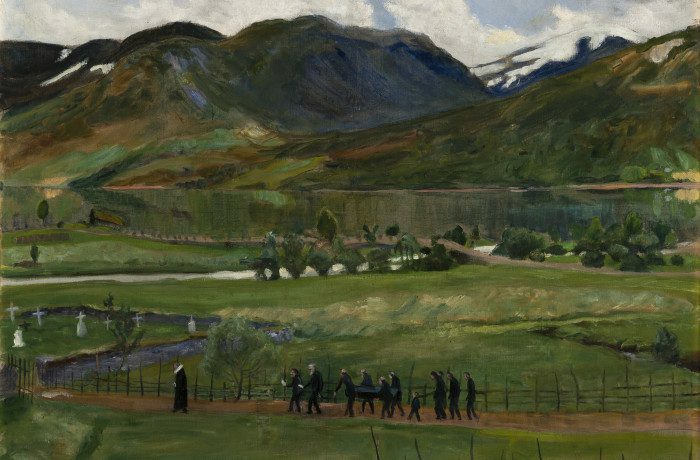 A land of field and fjord, mountain and lake, Jølster gave Astrup his subject matter and inspiration as an artist, and he returned again and again to the wooden buildings and snowy highland backdrop of his home village in his work. Foxgloves by Nikolai Astrup. Picture: Dulwich Picture Gallery. Astrup’s father, the pastor of Ålhus church, was determined that Nikolai should follow the family’s tradition in the priesthood and dispatched his son to his grandmother in Trondheim to attend the cathedral’s school. The 15-year-old Nikolai had other ideas however, having decided to become an artist long before he left. School did not bring him much success – with little enthusiasm for anything other than natural science and a propensity to illness (Astrup was asthmatic), his academic results were unimpressive – but he found inspiration in the galleries of Trondheim. There, he discovered the great Norwegian landscape artists such as Christian Skredsvig, Eilif Peterssen, Lars Jorde, Otto Hennig, Knud Baade and Erik Bodom, and his ambition intensified. Before he’d even turned 16, Astrup had painstakingly archived all his own drawings; each one signed, dated and neatly filed. With three years of art education behind him, Astrup embarked upon the mission that preoccupied him for the rest of his life. Eschewing the attractions and career-building potential of basing himself in Kristiania, he instead returned to Jølster, determined to find the artistic language necessary to portray his homeland. 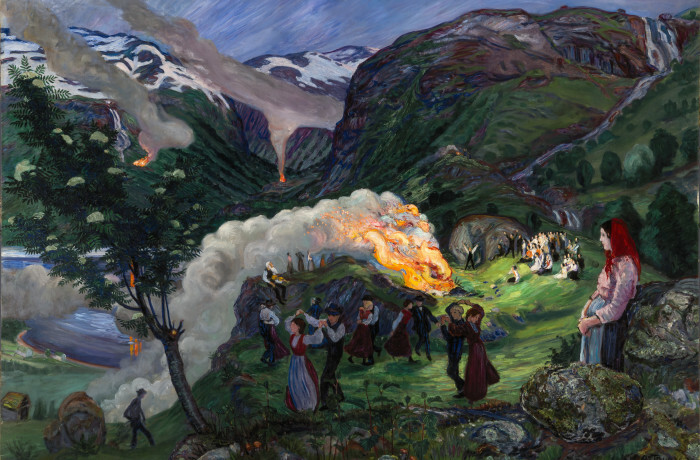 For Astrup, this meant developing a way of depicting the ‘childhood kingdom’ he carried with him, the natural environment he grew up in, the reality of village life on Lake Jølster, and the unique landscape of the country that he loved. Marigold Night, by Nikolai Astrup. Picture: Dulwich Picture Gallery. Astrup’s debut exhibition – and breakthrough – was held at Blomqvist Kunsthandel in Kristiania in 1905, marking the beginning of three years of prolific output. Focusing on drawing out the mystique of nature, Astrup produced a broad series of paintings characterised by dark, heavy palettes and a mood of sublime gloom. His growing reputation earned him a number of scholarships and exhibitions, including a landmark show in Kristiania in 1911. He spent six months studying in Berlin, which resulted in little work, but refined his sensibilities still further. In 1912, despite his ongoing conflict with his father and the fact that his bohemian lifestyle contrasted sharply with the conventional nature of small-village life, Astrup bought a small farm at Sandalstrand on the shores of Lake Jølster, with a view of his father’s church across the water. He named his studio Astruptunet, and together with his new wife Engel Sunde Astrup – the daughter of a local farmer – and their eight children, remained here for the rest of his short life. Having a wife and family changed Astrup’s art. His interests were the same, but his palette became warmer and richer, the tone of his paintings became more positive and his subject matter broadened to include depictions of gardens, flowers, and family life. (Engel herself appeared in a number of his paintings from Astruptunet and the vicarage garden at Ålhus). His landscapes became more expressive, acquiring more mystery, drawing on folklore and symbolism. Looked at a certain way, his trees could be trolls, and human forms might be found hidden in the contours of his mountains. Some of his most celebrated works of this period feature the bonfire celebrations of Midsummer, which, as a child, he had never been allowed to attend because of their ostensibly pagan origins. 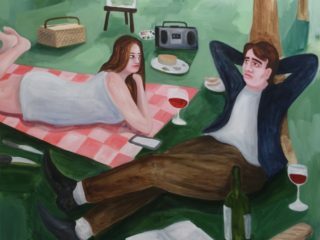 Looking at these today, it is easy to see in them an almost voyeuristic quality – that of an outsider observing music and festivity with unrequitable longing. Morning in March, by Nikolai Astrup. Picture: Dulwich Picture Gallery. Over the years that followed, Astrup struggled with the financial upkeep of his farm and atelier, and his health continued to be trouble him, with his asthma further complicated by tuberculosis. He continued to work during his periods of good health, after 1920, began exploring new ways to paint, travelling to various places, including Algeria, in search of new sources of inspiration. His scholarship to Tunis in 1922 was likely more valuable for his health than his artwork. Early in 1928, he made a comparatively short journey to Førde in an open-topped car and caught a cold, which developed into pneumonia. He died on 21 January 1928, aged 47, having painted almost nothing beyond the surroundings of his home town. Although it might be easy to dismiss Astrup’s unusually narrow focus as a sign of his lack of ambition as an artist, such a view overlooks the poetic scope and personal nature of his vision. His paintings and woodcuts do a lot more than merely represent the life and landscape that surrounded him; they are wellsprings of Astrup’s longing to enact a wholly subjective immersion in the cherished realm of his childhood. They have political implications too; the industrialisation of Europe in the 19th-century had led people away from their rural family homes and into cities, removing the foundations of their identities, cutting them off at the roots. 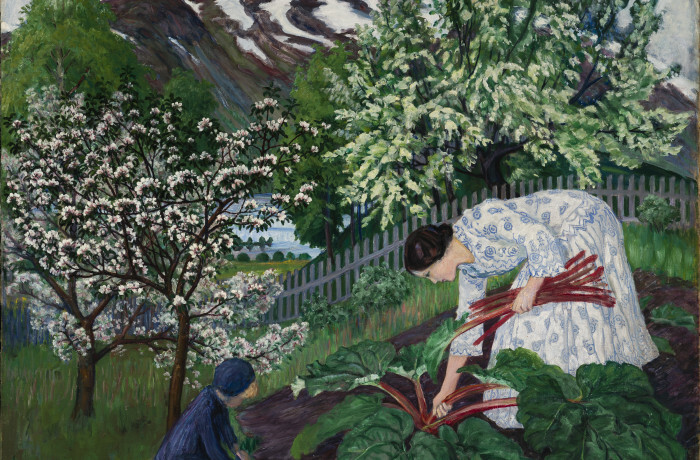 The personal and cultural nostalgia behind Astrup’s work celebrates village over city, Jølster over Kristiania, community over society, and nature over man. In a sense, every painting represents a journey home that can never be made. Such a uniquely personal endeavour meant that although Astrup had studied a number of artistic schools and traditions, none of them could really meet the demands of his vocation. He understood but rejected the impressionist-influenced naturalism of Backer and Krog and the neo-impressionism he encountered in Paris. The romance and sincerity of Böcklin engaged him more, and the naiveté of Rousseau was perhaps closest to his own ideas, but its poetic fantasy could never capture the light, topography and tradition of Western Norway. 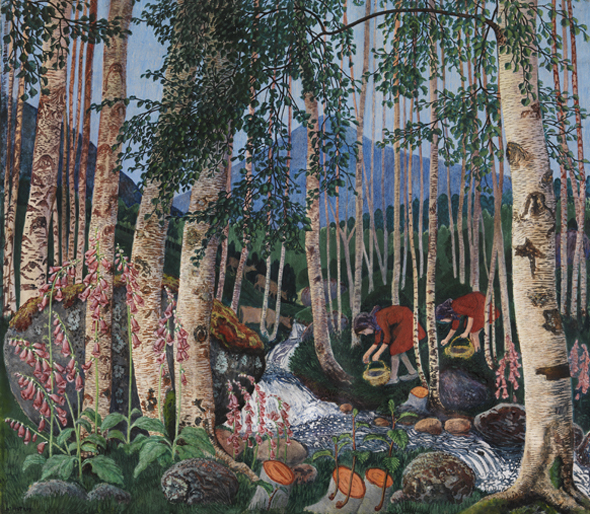 Instead, Astrup forged his own distinct style from the elements he drew from others’, plucking freely from the realism of the naturalists and the visual language of the symbolists, and combining these with his own childhood remembrances – already captured on paper and canvas in his youth and neatly archived in readiness. In this way, his own early artworks were as valuable a source as those of his peers and predecessors. 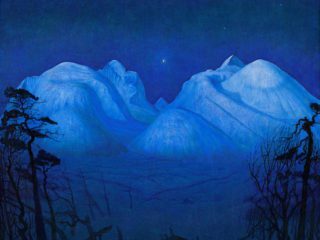 To paraphrase Backer: Nikolai Astrup revealed his genius by going in his own direction – one that no one else has taken before, or since. 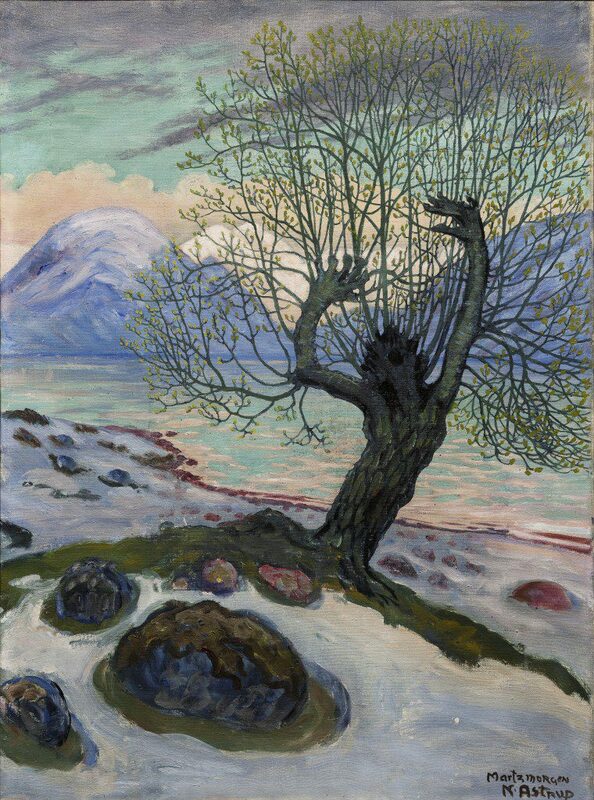 You can look at Nikolai Astrup’s paintings at the exhibition Painting Norway at Dulwich Picture Gallery.